Tourists can do many things in beaches. The thing is there are too many options of shorelines. Belitung Island has numerous coastlines, as well. If you look for a reference, Batu Pulas Beach is a good choice. The locals also call it Tanjung Liu. The beach is popular due to its unique features. Not to mention it lacks visitors. That means you can enjoy a peaceful time in Batu Pulas. Batu means “stones” and Pulas means “fast asleep”. In a nutshell, it is the beach of sleeping rocks. 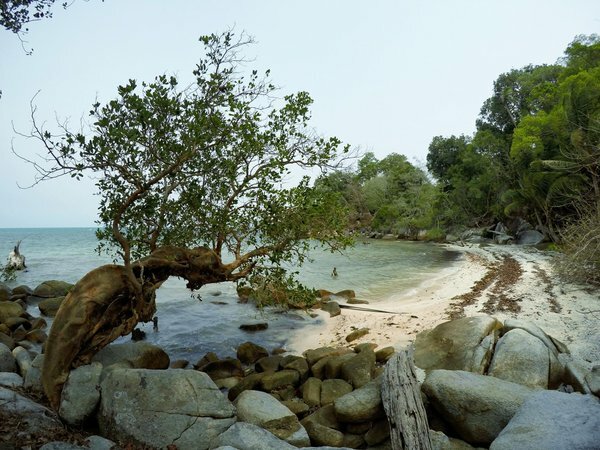 As mentioned before, Batu Pulas is the home of granites and coastal rocks. The terrain is covered mostly by rocks. That means you should not expect sand parts there. Apart from rocks, there are also several trees. They make a shady and calm ambiance. All these features are supported by gusty wind and bright sky. What a perfect combination of nature! Is some parts of the rocks, you can find perfect spots for fishing. If you don’t like fishing, you can simply sit on those stones and enjoy the views of the sea. The most common thing to do in Batu Pulas Beach is photography. Some people come there for hunting good objects. Even the granites are worth a shot. This rocky beach features different shapes and size of rocks. Usually, a solo photographer may take pictures of the rocks and the sea. If you have a companion, he or she can be a model. The beach definitely becomes a perfect background for your photo. Regardless of your photography skills, you won’t regret coming there. People come to Batu Pulas Beach for different reasons. Apart from photography, the beach also becomes the best location to enjoy sunset and sunrise. While sitting on the granites, you can witness such natural occurrence. One thing, make sure you come at the right time. Next, it is the waves. Batu Pulas features strong wind and wild waves. It is likely the sound waves never stop. No wonder, the beach is noisy. Despite this condition, you can still find peace. Thanks to the serene atmosphere! If you come at noon, you must apply sunscreen cream on your skin. It is because the temperature is hot, especially in summer. For those who come with kids, Batu Pulas Beach can be quite dangerous. A careless act leads to injuries. Make sure you watch the children well. Don’t let them roam around without your supervision! The rocks are perilous. Also, you should choose safe spots for taking pictures. It is because several locations aren’t safe for you. Your primary destination is Candil Village. It belongs to Kelapa Kampit District. If you come from Tajnung Pandan, you can take Bandara – Manggar Street. The trip is about 50 minutes and the distance is 42 km. As an alternative, you can take Sijuk Raya Street. It takes longer, though. Make sure you carry some refreshments!